Mauricio Pochettino has backed Tottenham goalkeeper Hugo Lloris saying "we have short memories in football". The France captain, 31, has endured a mixed season since winning the World Cup in July and was sent-off in the 2-2 Champions League draw against PSV Eindhoven on Wednesday. "I'm so objective, he is one of the best," said Pochettino. Against PSV, Lloris raced from his goal to bring down winger Hirving Lozano as the visitors led 2-1 with 11 minutes left. The Dutch side equalised eight minute after his red card. 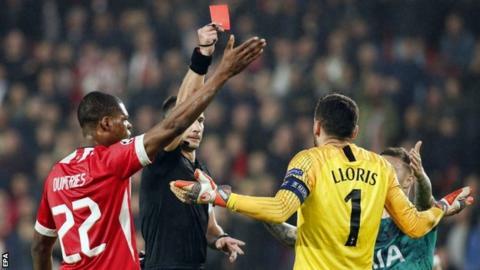 Lloris, who has only played seven games for Spurs this season due to injury, also gifted Barcelona their opening goal in a 4-2 defeat earlier this month. "Things happened and you cannot change," said Pochettino. "He was important in games like Newcastle, Fulham, Manchester United, West Ham. In the games we won he was important. He didn't play and we lose games. We have short memories in football. After Watford I remember, 'oh we miss Hugo'." He added: "When you are a keeper you love to take risks. It's a very unfair position. You need to be strong in your mentality to arrive in that level to play. "I admire the keepers. It's an unfair position and its difficult for them to enjoy playing football. To be put in front of people that are trying to kill you shooting at 100mph. You need to be brave and love the risks." At Friday's news conference, Pochettino was also asked about reports linking him with a move to Real Madrid if current boss Julen Lopetegui is sacked. "Because I am in a different country, my English is not so good, I don't follow too much the media," the Argentine, 46, added. "I don't have social media, I don't receive information. "That's why my head, my face I look younger than I actually am. Stuff like that happens in football. You can't change anything."